WineGB Bronze Award Winners 2018! We are extremely proud to announce that our 2016 vintage sparkling wines ‘Henry’s Harvest’ & ‘Heather’s Sparkle’ have both won bronze awards at this years WineGB (Wines of Great Britain) awards! 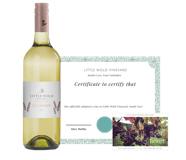 Established in 2012, Little Wold Vineyard in the Yorkshire Wolds has over 8000 vines of 5 different white grape varieties and 3 red. There first crop being harvested in 2016.